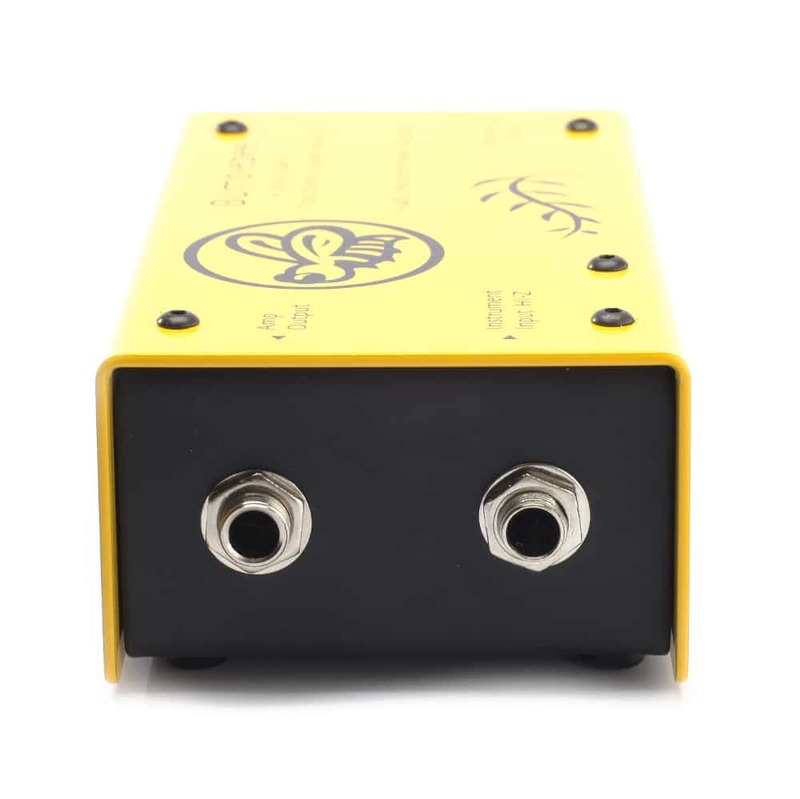 Bumblebee Bb-D1 is a DIY active DI Kit with a Jfet input stage and a custom designed toroidal output transformer. 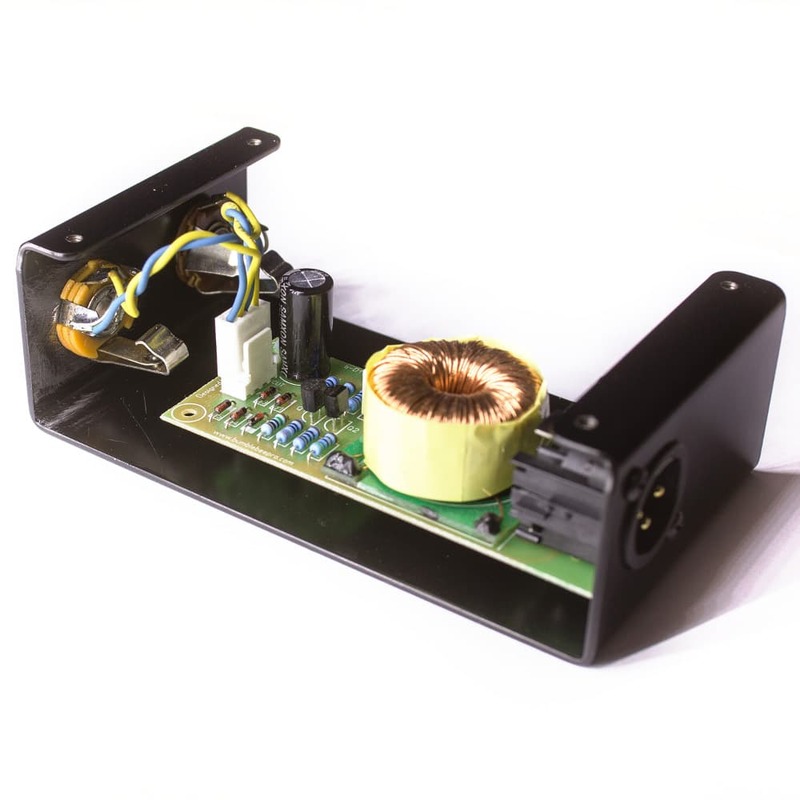 Bumblebee Bb-D1 is a DIY active DI kit with the j-fet input stage and a custom toroidal output transformer that we’ve designed particularly for this application. J-fets are know to be the most “tubey” sounding semiconductor elements with sonic coloration resembling the character of pentodes, j-fets also have very high input impedance, which is beneficial for passive guitars and basses due to detailed reproduction of the high frequency range, making the sound dynamic and lively. 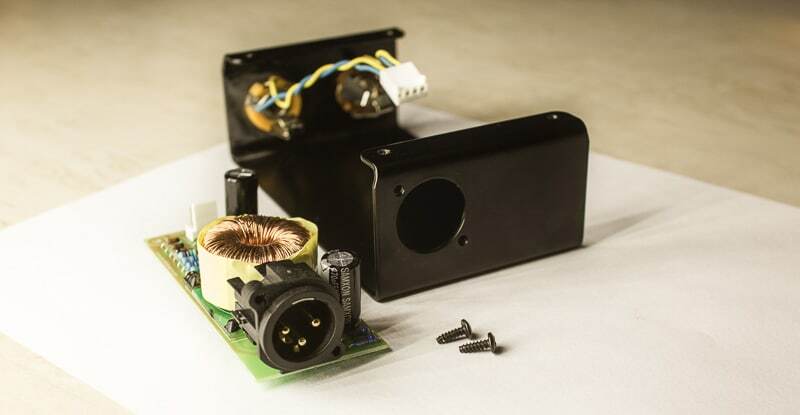 Toroidal transformers have many benefits as well, the most important of them being a very high natural immunity to EMI eliminating the need for extra screening and very low winding resistances minimizing the signal loss and thermal noise. 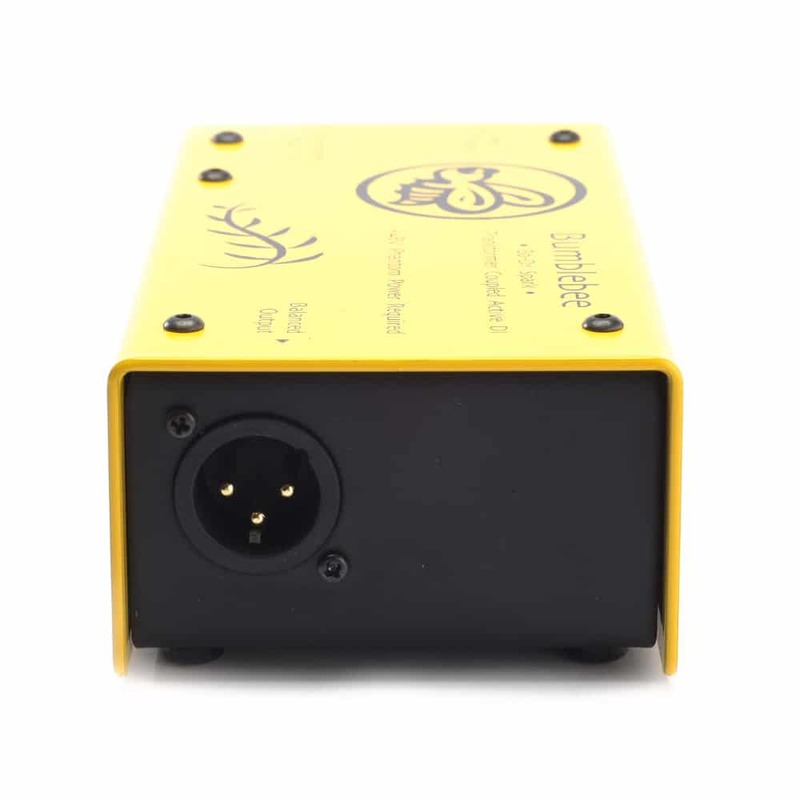 This Active DI does not have a negative feedback, which is very beneficial for the sound quality, but the downside of such approach is the necessity to sort the j-fets in ranges by their Idss (maximum idle current) and to pair with different source resistor (Rs) values for each range. Not too good for serial production, but perfect for DIY, so every builder could benefit from the great sounding simplicity. Your DIY Active DI Kit will come with j-fet/Rs pairs properly picked, so the hardest work is done for your. The second stage is a typical bipolar transistor emitter follower (current amplifier), which acts as a low impedance transformer driver for the best reproduction of the low frequency material, obviously it is very critical for using the Active DI with bass guitars, which is probably the main application for active direct boxes. The other important detail is the application of phantom power. It is not a secret that the quality of phantom power supplies in modern budget equipment is often questionable, therefor the direct box features a two-stage passive filter and an active voltage regulator made with three zener diodes, in order to make sure that only the perfectly clean current is powering up the device. The circuit does not require any adjustments or setting-up and will work right away when assembled. What exactly is included in Bb-D1 DIY Active DI Kit? Everything. 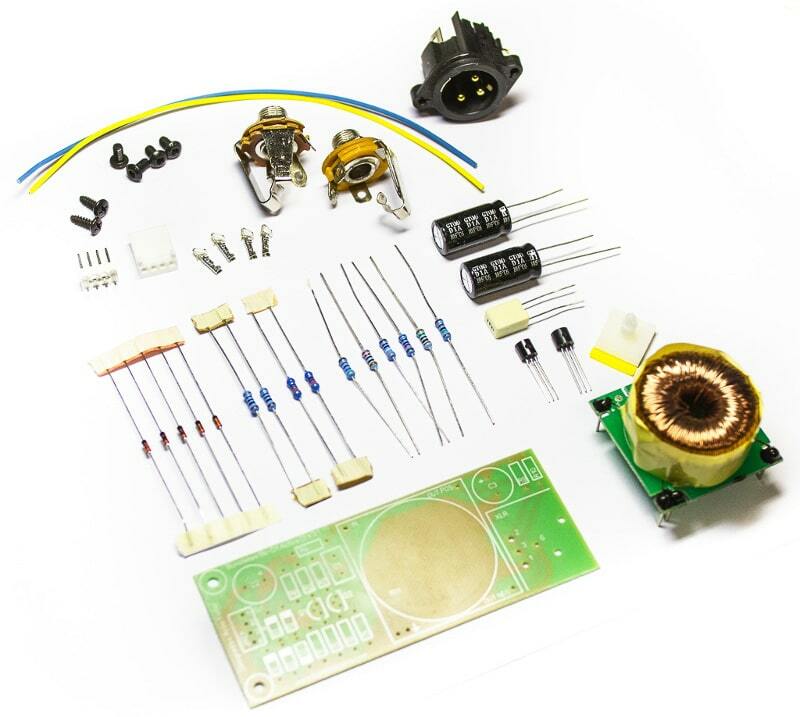 The kit includes all the parts needed for building the Bumblebee Bb-D1 DIY Active DI Kit. Check out the detailed assembly manual with every step well-described and clearly illustrated with photographs. As a result, the kit is easy enough to DIY for any person with minor experience in electronics, only basic soldering skills are required. – The grounding wire that came with the kit isn’t mentioned in the build guide. – Bridging pins on the jack connectors took a bit of figuring out since their pin layout was different from in the photos (an illustrated diagram of the jack connectors would help here). – There were no screws included for attaching the XLR connector to the case. – Most of the solder pads are very small, making it quite hard to get a good solder joint without a good fine tipped iron. All in all, I still think this is a very good DI and would recommend it. Keen to try out one of the ribbon mic kits next. Hello, Nick, thank you for detailed feedback! First of all, we are working on MkII version of this DI that will be much more convenient to assemble and will have PCB jack sockets instead of wired ones. Regarding missing XLR screws – I very much apologize, it is definitely our fault. Hope you’ve managed to solve the problem. This is a fantastic DI, and a great bargain as a DIY kit. I now have three of these. This DI box is amazing! It feels robust and the sound quality is excellent. I haven’t had the chance to really use it yet but having tested the device upon completion I couldn’t believe how good it sounded. As for the build I couldn’t have asked for a better introduction into the world of audio DIY. Artur was a great help and answered all my queries as quickly as possible and with great detail. There wasn’t anything particularly complicated about the build so it really is the perfect project for anyone looking to get into electronics and particularly audio electronics. The fact that you then get a great piece of pro audio gear at the end of it all makes it all the more satisfying. I’d like to build another one!! 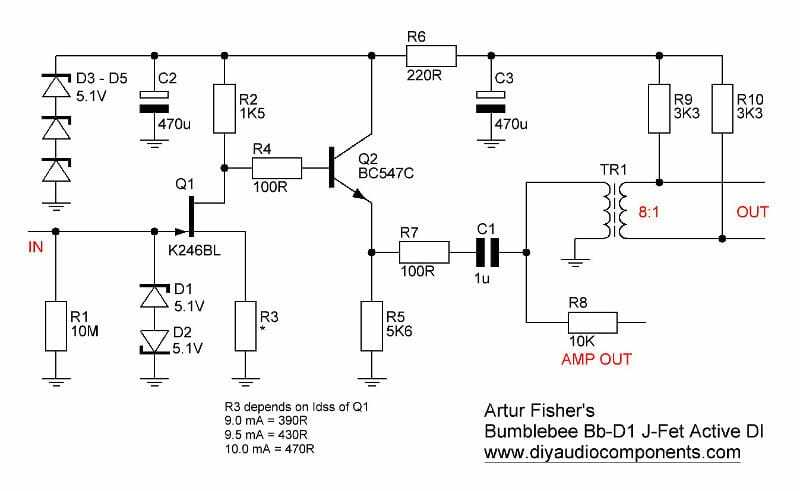 The signal that goes to the amp is also processed by the JFET, which sounds fantastic. The downside is that the DI only sends your signal to the amp when there is phantom power going to the DI. And in live-situations you sometimes have to wait to get your DI connected. So while waiting, you don’t have sound. But that’s a small inconvenience compared to the advantage of getting the lovely processed sound. And you could use a simple A/B-switcher to fix that. The DI doesn’t have a pad or ground lift. But until now, I haven’t missed them. I like things that do one thing very well, and that is what you get with this DI. It is clear that the builder makes deliberate choices, all in function of getting the best tone. And that is what we all want, right? It took me less than an hour to build, test and box the Bb-D1, with no problems following the instruction sheet, (you do need a good soldering iron with a fine tip) apart from one of the case screws which needed a hex driver slightly bigger than the others. The little yellow thing worked first time and is thoroughly excellent in design and sound quality. Thank you very much Artur! Cheers, Dai. Great DI which adds a little distortion to guitars and bass. It’s almost unnoticeable but there non the less. Easy to build, it took me about 40 minutes to throw this together. This is a very easy build for anyone with basic soldering skills. The end result is a very nice sounding Di that gives full sounding lows and clean vibrant highs, I use it on my piezo film pickups that have very high impedance with great results. Overall very good with great quality parts. Great product!! Whilst the DI sound great I do need to complain about the quality of the jack input plug that came with the unit. Whilst I was tightening it into position the thing broke and I had to find a replacement and redo all the wiring again. It seems that the quality of these input plugs is very poor and I would suggest for further kits that you replace it with better quality plugs. The DI itself sounds good and although I have not done sufficient tests I believe it can compete with many of the big name DIs out there. Thank you for letting me know about the issue with the jack. I am aware now that there was a bunch of plugs of questionable quality, we stopped supplying them after a couple of first complaints. Obviously your kit had one of those. I apologize about the issue! I assume that you’ve rated the DI kit with three stars solely due to this issue and hope that you like the DI itself. Feel free to write me anytime if you have any problems or questions. Best! I used my BB Active DI at church last Sunday (I play a MIM P-bass) and WOW! We have been using a cheap passive DI and there wasn’t any definition to the bass, just low end rumble, I plugged this in and all of the issues with the bass tone through the system were gone, every note rang out clean and clear… I just ordered a second one!!! I just built and tested my 2nd one of these. I’ve tried this on a passive electric bass, an upright bass with a nice pickup, and a keyboard (S90XS). 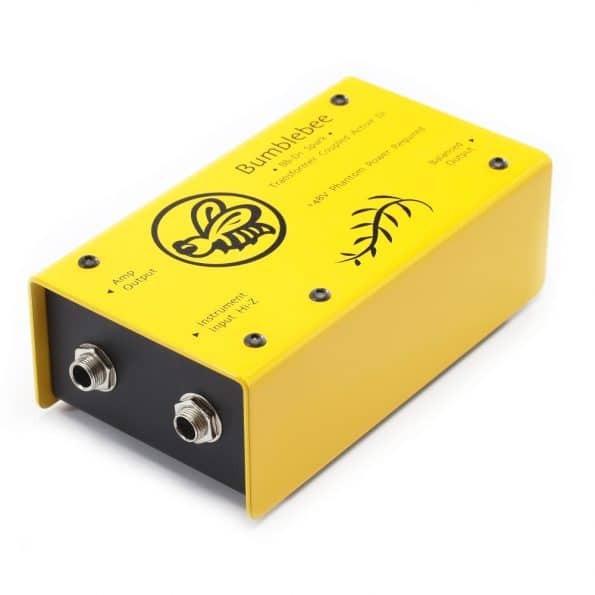 It’s generally advised to use a Passive DI with a modern keyboard… but after I tested this Bumblebee Active DI on the mono out of my keyboard… and then A/B’d against the Direct In on my Apogee Ensemble I was thoroughly impressed and immediately ordered another matching unit. 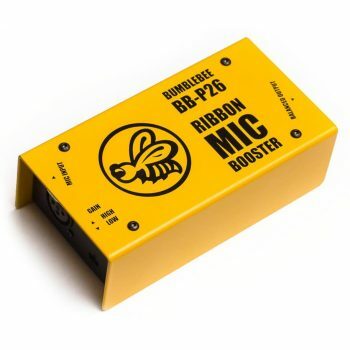 I matched the level for both recordings… but the Bumblebee Active DI just gave me more Low-End content and more High-End content than the Apogee Ensemble. The apogee sounded fine… but just very straight and clean… Through the Bumblebee Active DI it just comes alive and sounds amazing. This is not the easiest kit to build due to have to verify which resistor is which by testing with a multimeter …not easy for a drummer : ) …and by verifying color bands on the resistors, etc. But overall, it’s a great design and build. I bought one… tested it… and loved it so much that I bought another… I highly recommend it…. You won’t regret it. 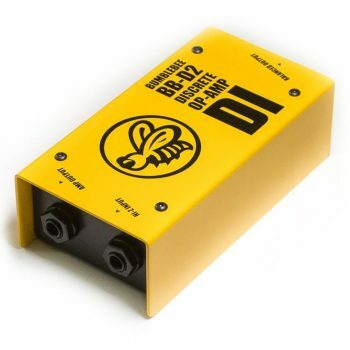 The Bumblebee D1 Active DI Kit is dead easy to build. Mostly because it has just a handful of parts and there’s not much room for error. Another contributing factor is the pre-drilled case. What’s more: high input impedance (10 megOhms = gets along well with piezzo signals) and high headroom. The sound: I have about a dozen other DIs and maybe a dozen more at the rack, with the mic preamp DI inputs. Why would I need another DI? Simple: high headroom, high impedance – I just got two of those… and I need DIs that can be in the tracking room, on the floor with the band. Good for tasks where a passive DI or an active with just 1 megOhms will not do. Okay, the sound: compared on the same sources with another high-Z, high level DI, the Avenson small DI it’s obvious that the different circuits sound… different. The Avenson has no transformer, has no “through” to amp and sounds leaner. Good for signals that need to be “spiky” and have aggressive transients. The Bumblebee sounds fatter, and (I suspect because of the JFET and the transformer) acts like a clever little compressor to even out the biggest spikes a bit. To simplify it, the Avenson is like a Fender Strat and the Bumblebee like a Gibson LesPaul in flavor. Just not THAT big difference. The noise floor of both pieces is very low, no worries, I couldn’t make out a difference in that regard without proper measuring equipment. Would I buy one again if I lost it? Yes. Recommended, even if you so far have no active DI box at all and it would be your only one.